Jeff McErlain - Strat Tones Monster! 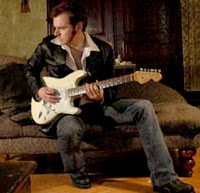 Jeff McErlain plays Michael Tuttle guitars and is one of the featured players on Tuttle's website. McErlain is a connoisseur of fine Strat tones, and can really bring out the full Strat palette in his playing. Visit www.myspace.com/jeffmcerlain for taste of his tunes-- and you'll wanna pour that stuff over your waffles! Jeff is also a NYC based writer, teacher & producer; having written guitar instruction materials for both Alfred & TrueFire, as well as articles in GP & GW. I just discovered Jeff when researching Michael Tuttle for Friday Strat #96. 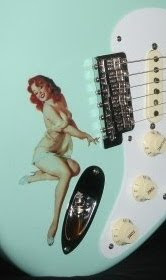 It's a real pleasure to feature someone who plays the Strat the way it oughta be played. Pass me more waffles please!